Restoration of the street level was underway in 2014. In the years just prior to the outbreak of the Civil War, elegant mansions rose along Fifth Avenue north of 23rd Street. Madison Square had been officially completed on May 10, 1847 and quickly high-end homes began surrounding the park. On August 23, 1859 developer Amos Eno opened his lavish Fifth Avenue Hotel at the northwest corner of Fifth Avenue and 23rd Street. About this same time Phillips Phoenix had his wide, two-story private stable constructed directly behind the hotel at No. 6 West 24th Street. Wealthy and a touch flamboyant, Phoenix was well-known in society. His keen ability to sense financial opportunity and his willingness to adapt would serve him well as the exclusive residential neighborhood was taken over by commercial interests following the war. By 1879 23rd Street was seeing the first hints of the entertainment district which would transform it by the end of the century. That year Phillips Phoenix joined with Amos Eno to erect the Madison Square Theatre at No. 4 West 24th Street, abutting the stable. He also commissioned the architectural firm of Kimball & Wisedell to convert the stable, adding a third story. 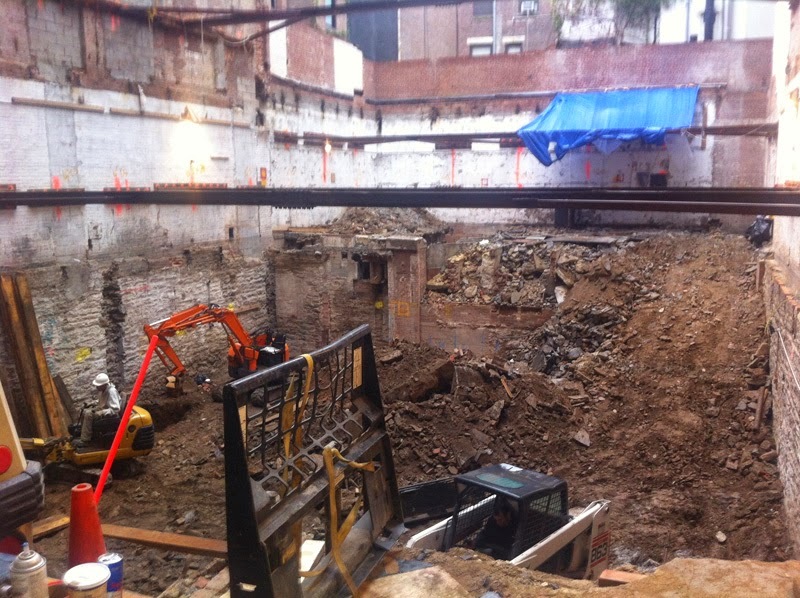 Instead of horses and carriages, the building now housed theater offices and dressing rooms for the thespians. One year later the architects obliterated the utilitarian roots of the structure by designing a commercial façade. Sharing space in the 25-foot wide building, at least for one year in 1882, was the publishing firm of G. P. Putnam & Sons. In the meantime, Phillips Phoenix enjoyed his wealth and social status, maintaining a country home in Tuxedo. It was there on December 3, 1886 that Phoenix took possession of his new 31-foot ice yacht “to be used this Winter on Tuxedo Lake,” reported The New York Times. Kimball & Wisedell's new facade for No. 6 can be seen at the far right of this postcard. Hoyt’s plans hit a snag, though. Two months later The New York Times announced “Hoyt and McKee have decided to close their season at the Madison Square Theatre March 31.” Hoyt’s hit A Trip to Chinatown had already run for 700 performances and the house was still packed. But the duo could make more money putting the show on the road than keeping it in New York. And they did not yet have a “proper class of attraction” to replace it. 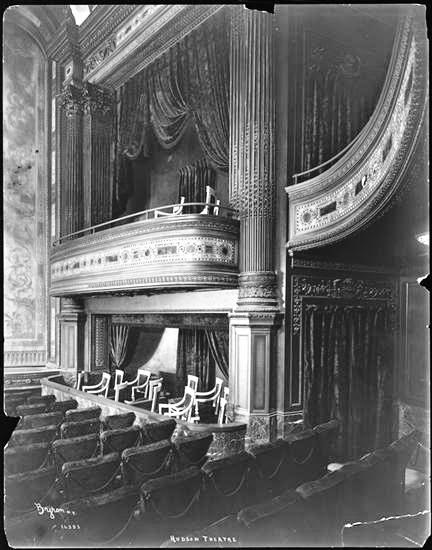 “This will be the first time the pretty little theatre has been closed to the Hoyt plays since Hoyt and Thomas assumed the management,” noted The Times on March 19, 1894. Within only a few years the theater district would move northward to Longacre Square, later renamed Times Square. The Madison Square Theatre hung on; but as early as 1903 was renting space to at least one small business, S. B. Goodale & Son real estate, in No. 6 West 24th Street. In 1906 Walter N. Lawrence ran the theater and that year he paid the $500 fee for a one-year amusement license. The license covered both No. 4 and No. 6 West 24th Street. But the days of light theater here were quickly drawing to an end. In 1909 the aging Phillip Phoenix, always willing to adapt to changing times and neighborhoods, commissioned the well-known architects Maynicke & Franke to renovate No. 6 into a restaurant with an apartment on the top floor. The architects turned to the Arts & Crafts style which rejected the busy, over-decorated designs of the Victorian era. More visible in suburban residential structures, the Arts & Crafts style arrived on West 24th Street as a delightful surprise. The gape-mouthed lions' heads originally held the supports of a canopy. Brick side piers with recessed panels rose to a deeply overhanging cornice supported by truss-like brackets. They embraced a cast metal façade enhanced by plain, geometric recessed panels. The openings, three to a floor, were nearly floor-to-ceiling and flooded both the upstairs apartment and the second floor dining room with daylight. Two snarling lion heads originally upheld a marquee or canopy that sheltered patrons from direct sunlight or bad weather. William H. Lubold’s restaurant took over the two lower floors. Variously listed as “Lubold’s Café & Restaurant” and “Barbers Café & Grill” over the years, it was a favorite luncheon destination for the businessmen now working in the bustling Madison Square neighborhood. Although the Lumbermen’s Club moved to the nearby Hoffman House Hotel a year later, other organizations made ample use of the dining room in Lubold’s. On March 16, 1918 the New-York Tribune reported on the first anniversary celebration of the Erie Club held here. William Lubold died in July 1920 “quite suddenly…from diabetes.” His obituary noted “The restaurant was patronized quite extensively by members of the trade in the Fifth Avenue Building and that vicinity, all of whom will regret to learn of Bill Lubold’s passing.” The article mentioned that the business would be continued by Lubold’s sons, Howard and Wilbur. The remarkable little building continue to house a restaurant on the first floor throughout the rest of the century. In the 1970s the two upper floors were used as a photo studio. A some point the street level was obliterated through misguided modernization. Somewhat surprisingly, a 2013 renovation resulted in the sympathetic reconstruction of the lost architectural details of the first floor. A restaurant continues to operate here. The Arts & Crafts building with its long and varied past, nearly lost among the tall loft buildings on the block, is a delightful architectural surprise. In 1831 John Brown began construction on his wide brick-faced home at No. 35 West 10th Street. Two stories tall with a dormered attic, it boasted a few extras—Flemish bond brickwork and a sweeping stone stoop above the brick basement level, for instance—that marked the house as a step above normal. But, unlike the lavish Henry Brevoort mansion that would soon rise nearby on Fifth Avenue and 9th Street and set the bar for Fifth Avenue residences, Brown’s was a merchant class house. Within a few years of the completion of Brown house in 1832 other homes along the block would appear. The family retained possession for years, with Dorcas Brown (possibly the wife or daughter) listed as living here. In 1871 it appears that a room was rented out. Elmer Poulsen was a senior studying at Columbia College. The young man was from Cameron, Missouri; but listed his New York address as No. 35 West 10th Street. Interestingly, when real estate operator Alida Van Schaick sold the house to Isaac E. Wright (another property buyer and seller) on February 1, 1881 the Real Estate Record & Builders’ Guide still described it was a “two-story brick dwelling.” Yet the alterations that resulted in the full three floors we see today reflect architectural trends popular around the beginning of the Civil War—the leafy, scrolled brackets of the paneled cornice, the mid-Victorian double doors, and the extended parlor floor windows. The renovations that resulted in a full third floor are evident in the change of Flemish bond brickwork to American bond. In 1898 Philip Webb lived here. Webb was employed by the Lehigh Valley Railroad in the freight department. In December that year he and two coworkers planned a night of debauchery in Manhattan’s notorious Tenderloin District. It did not play out well. One of the men, named Hammond, backed out at the last minute; but 31-year old Thomas McKeever came into the city on Saturday morning December 10 and met Webb. A married man living in Roselle, New Jersey, he told his family he would not be home until Sunday “as he intended to go shopping,” reported The Sun two days later. The newspaper said “He intended purchasing gifts for his four small children.” But the well-to-do man and his cohort, Philip Webb, had carousing in mind as well. With his excuse in place, Thomas McKeever set off with Philip Webb on a night of eating and drinking that ended up “in the apartments occupied by Sadie Williams and Maggie Winnie” at No. 257 West 39th Street in the seedy neighborhood known as Hell’s Kitchen. Not long after the men arrived, McKeever complained of feeling ill. As Webb and the two disreputable women looked on, his condition worsened and he died. It was not until nearly 10:00 on Sunday morning that the death was reported. The women were questioned by police and released. Webb first arranged to have the body removed to James Winterbottom’s undertaking business at No. 638 Sixth Avenue. Then in the afternoon he telephoned New Jersey, and friends broke the news to his wife. Although the autopsy found that the death was caused by liver and kidney disease, the family would have to suffer the humiliation of the respected man’s corpse being found in the bed of a prostitute. Philip Webb’s public embarrassment was no less severe. Although No. 35 West 10th Street was relatively small; it sat on a well-respected block where millionaires still lived in mansions built a generation later. On February 5, 1903 Harry Horton Benkard married Bertha King Barlett in a sumptuous ceremony in Grace Church. The pews were packed with the upper echelon of Manhattan society—Mrs. Stuyvesant Fish, the Robert Livingstons, Reginald C. Vanderbilt, Isaac Townsend and his daughter, Mrs. William K. Vanderbilt and her sister Mrs. Hermann Oelrichs, and the Stephen Van Rensselaers among the virtual Who’s Who of society. The newlyweds’ choice of the quaint Federal-style house was perhaps prompted by Bertha’s intense interest in the past. She was among the first to collect American furniture and a period drawing room from the Benkard’s Long Island estate was later installed in the Metropolitan Museum of Art. 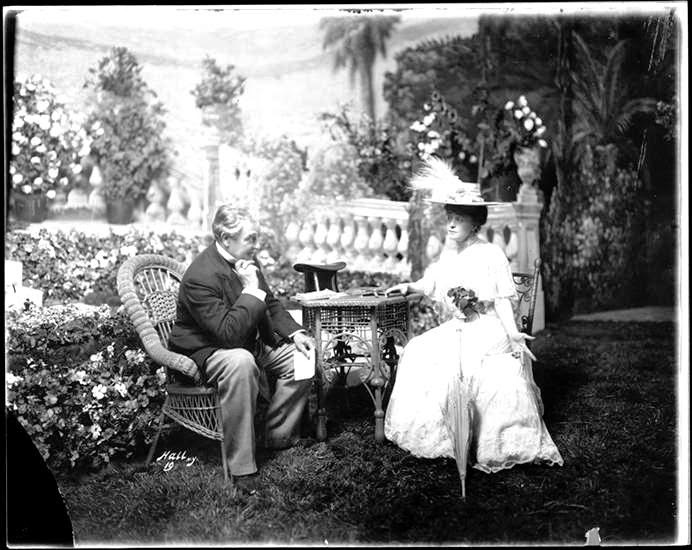 They barely had time to move their things in following their honeymoon trip, before they were off to Newport In July 1903. By 1910 high-profile attorney John G. Milburn, Jr. owned the house. On the afternoon of November 8 that year burglars broke in. They made off with a small iron safe but inadvertently left behind a bag of loot including a clock. Their mistake would change the direction of American forensic investigations forever. New York detectives were just beginning to use a new system for identifying criminals—the fingerprint. When police opened the bag of valuables left behind, they pulled out a clock and on its glass face was a clear fingerprint. Since 1903 the New York State Prison system had been fingerprinting prisoners and other states followed suit. Detectives compared the print with those of Harry Peck, a criminal recently released from the Charlestown, Massachusetts prison. The prints matched. They went to the apartment of Harry Peck on November 18. As he “pushed his way” into the apartment, Detective O’Farrell noticed a small photograph on the floor. He remembered that the list of stolen items included a gold locket with Mrs. Milburn’s photo inside. “It was that of Mrs. Milburn, he says,” reported The New York Times the following day. A suitcase in the apartment held many of the articles taken from the 10th Street house. Milburn and his roommate, Joseph Cohen, were arrested. Both men, it was reported, had prison records for burglary, robbery and other offenses. The very wealthy Milburns spent much of their time at their country estate near Great Neck, Long Island and in Europe. John G. Milburn, Jr. was a well-known polo player who repeatedly appeared in the social pages playing with partners like Raymond Belmont or H. C. Phipps. 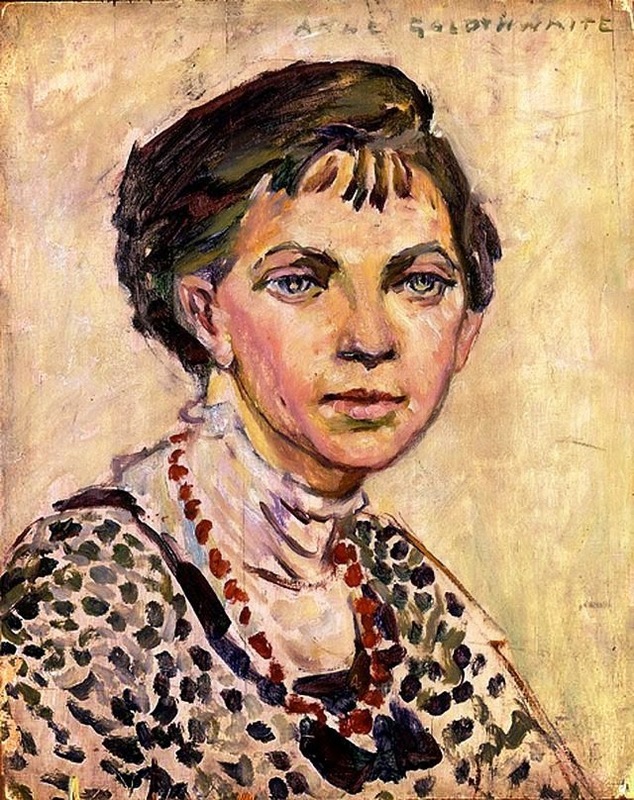 In the meantime Anne Goldthwaite was making a name for herself in the art world. Born in the South to a former Confederate Army captain, she had studied in New York’s National Academy of Design. She briefly studied in Paris beginning in 1907, where she met Gertrude Stein. As war clouds developed over Europe, she returned to the States. A month before that article, John G. Milburn, Jr. had leased the West 10th Street house to the artist. It was the perfect location for her. By now Greenwich Village was established as the center of Manhattan’s artistic community and the West 10th Street block not only housed artists like Kikishi Yama, sculptor Charles Keck, and D. Maitland Armstrong; but the famous 10th Street Studios building was just three houses away. Like many Greenwich Village denizens of the period, Anne Goldthwaite was actively involved in social issues. Among her most passionate causes was women’s suffrage. On June 3, 1916, when the New York Giants met the Cincinnati Reds on the field of the Polo Grounds, Anne Goldthwaite was there. It was Suffrage Day at the ballpark. When the magnificent Jefferson Market Courthouse a block away on Sixth Avenue was threatened in 1961, Philip Wittenberg led the crusade to save it, along with Margot Gayle, Democratic district leader. President of the Committee For a Library in the Jefferson Market Courthouse,” Wittenberg hosted its first meeting here on February 18. “Mr. Wittenberg pointed out that real estate men had been eyeing the sites of both the jail and the courthouse as ‘a nice piece of property’ for a new apartment house,” reported The Times. The Committee triumphed and in 1967 restoration and renovation efforts began on the New York landmark. The charming brick house remains a single family home after nearly 200 years; an important tile in the fascinating mosaic that makes up this block of West 10th Street. On March 26 Heye’s architects, J. B. McElpatrick & Sons filed plans for the new structure. They estimated the cost on filing at $175,000. But that would soon change. Within a month the old buildings were being demolished and Heye was receiving bids for contractors. 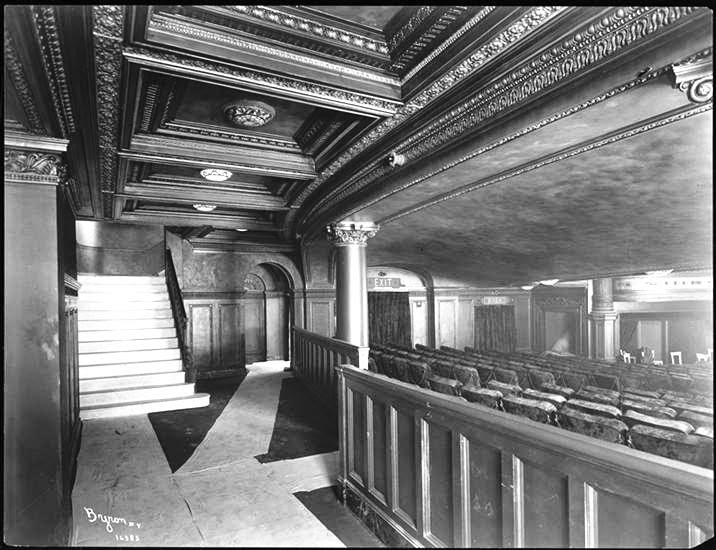 On April 5 the Record & Guide noted “The theatre will seat 1,400 persons and be fitted with tile, mosaic, marble, brasswork, etc., electric light, steam heat, ventilators, plumbing, etc.” Along with the electric lighting, Heye wanted all the modern conveniences, including electric elevators. The estimated cost of the theater had now risen to $250,000. Construction was underway in October that year; but something seems to have gone awry between Heyes and his architects. Before the building was completed the following year, Israels & Harder were the architects of record. Producer Henry Birkhardt Harris had signed the long-term lease on the theater even before the land was acquired. And so now, as the building rose, George Heye wisely stepped back and let Harris take the publicity reins. At 9 a.m. on March 30, 1903 Harris hosted a splashy event to name the theater and to garner newspaper attention. He assembled his business staff and stage celebrities, including stars Alice Fischer and Robert Edeson at the construction site. 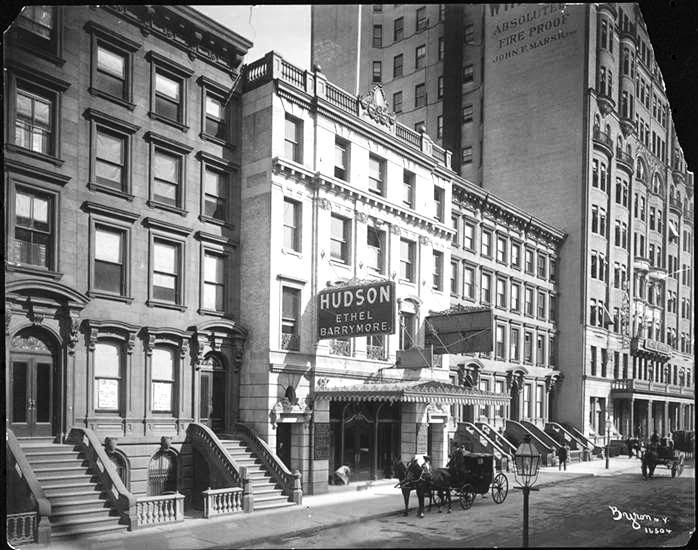 “Miss Fischer and Mr. Edeson scaled ladders to the roof, where a large white flat bearing the insignia of the company and the words ‘Hudson Theatre,’ in green letters, was adjusted ready for the raising. As Miss Fischer smashed a bottle of champagne against the flagstaff, saying ‘I christen thee Hudson,’ Mr. Edeson hauled the flag into place. Three cheers and a tiger were given, and then the companies assembled in the theatre and partook of luncheon,” reported The New York Times the following day. The architects made full use of electrical lighting. Each of the 264 coffers in the ceiling “modeled after a design suggested by an old ruin in Rome” contained an electric light. Around the domed ceiling were lights hidden behind a frieze. The lobby was separated from the foyer by massive bronze doors. The lobby ceiling was triple-domed, supported by arches and pilasters. “These arches have subdivided mirrors in the style of the famed salon of glass at Versailles,” reported The Times. But the domes were by no means ordinary. “The triple-domed ceiling of Tiffany glass and bronze, framed by conventional ivy bands, gives and effect of airiness and height,” said the newspaper. The Tiffany ceiling was back lit by concealed electric lights. 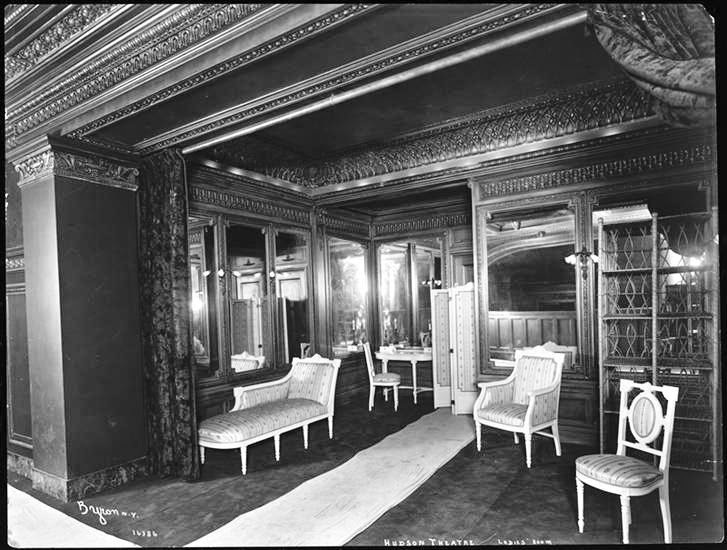 In stark contrast to the French-style ladies’ room was the men’s smoking room. Exposed beams of Flemish oak matched the paneled walls and a masculine chandelier of iron and copper was inlaid with art glass. New York drama critics then, as now, relished their power to decide the success of a play. In April 1904 actor Henry Miller was starring with Margaret Anglin in Camille at the Hudson when he reached his breaking point. Following the third act on April 30 the audience applauded so vigorously and continuously, that Miller stepped on stage before the curtain to address them. In March 1906 the pioneering modern dancer Ruth Saint Denis first appeared here. It was the first of her long succession of appearances on the Hudson Theatre stage. 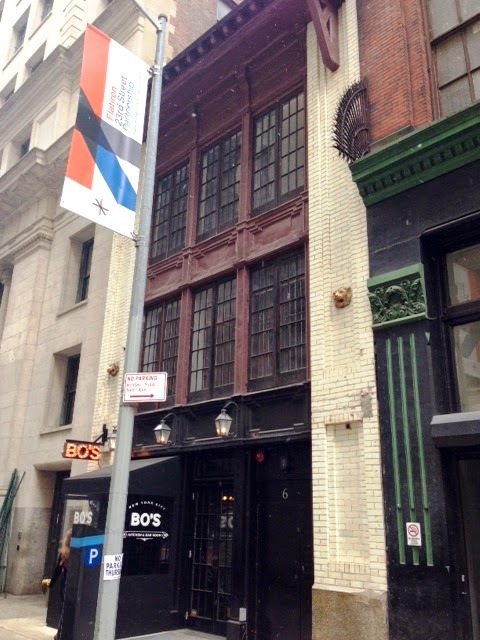 Around the same time the Actors’ Society laid plans for a benefit performance at the Hudson on May 4 for the society’s building fund. Then, on Wednesday April 18 at 5:12 am California was struck with an earthquake that devastated the city and set off gas-fueled fires that raged for several days. More than 3,000 people perished and over 80% of San Francisco was destroyed. Five days later the Actors’ Society voted to donate the proceeds of its upcoming benefit to the “theatrical sufferers” in San Francisco. Throughout the next few years the Hudson would host lectures and meetings in addition to the plays. Repeatedly the venue for suffragist meetings, it was also used for church services. Groups as diverse as the New York County Medical Society and the Elks New York Lodge No. 1 used the space. In March 1908 Henry B. Harris purchased the theater from George B. Heye for a reported $700,000—a staggering $18.3 million in today’s dollars. He continued his formula for drawing audiences by booking stage celebrities in plays by well-known writers. On December 23, 1908 alone it was announced that he had acquired the rights for Channing Pollock’s Such a Little Queen; had extended Ethel Barrymore’s engagement in Lady Frederick until February; and that L. Frank Baum, forever remembered as the author of The Wizard of Oz would give a special matinee on Christmas Day. 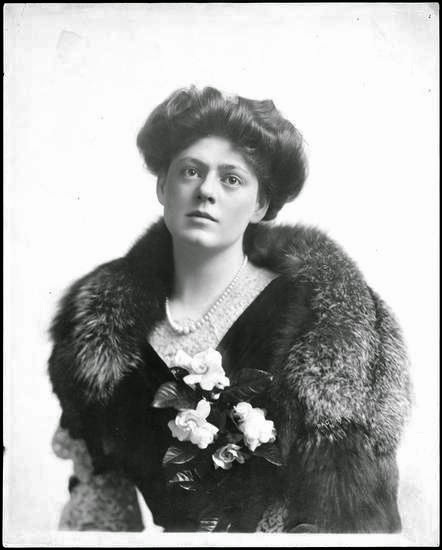 Ethel Barrymore’s extended appearance in Lady Frederick was almost cut short the following month. During the January 9 performance some in the audience were concerned. “Those who sat in the boxes and the front rows of the orchestra had noticed that Miss Barrymore looked ill, and that she grew more pallid as the play proceeded,” reported The Times. Nevertheless, the valiant actress completed the play. The audience enthusiastically applauded and demanded a curtain call. Apparently the old imperative “the show must go on” was strictly followed by Henry Harris. 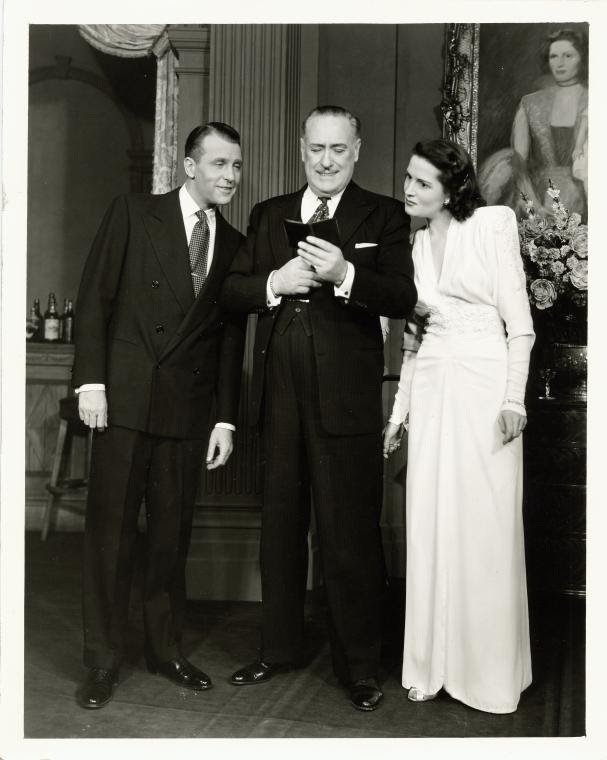 “It came out last night that Miss Barrymore fainted on Wednesday night at the end of the performance, but few in the audience knew about it,” noted The Times. Not content with his Hudson Theatre, Henry B. Harris opened the Harris Theater in 1906 and the magnificent Folies Bergere in 1911. The year after the opening of the Folies, Harris and his wife traveled to Europe. They headed back to New York from Southampton, England, on April 10, taking Cabin C-83 on the luxury steamship the RMS Titanic. While at sea three days later Irene Harris had an accident and fractured her shoulder blade. The following night, April 14, the couple was shaken when the ocean liner struck an iceberg. With panicked passengers crowding the deck, Henry Harris carried his wife to a lifeboat. She later recounted that she asked the ship’s officers if her husband could join her in the lifeboat to attend to her. She was told he could not. Mrs. Harris said her husband stepped aside, saying “I understand. The women must go first.” Billboard Magazine, on April 27, 1912, wrote “When Mrs. Harris saw her husband last, he was calmly waving goodbye to her from the deck of the Titanic. On April 19 both the Hudson and the Harris Theatres were closed as a gesture of respect; and on April 28 a memorial service was held in the Hudson Theatre. 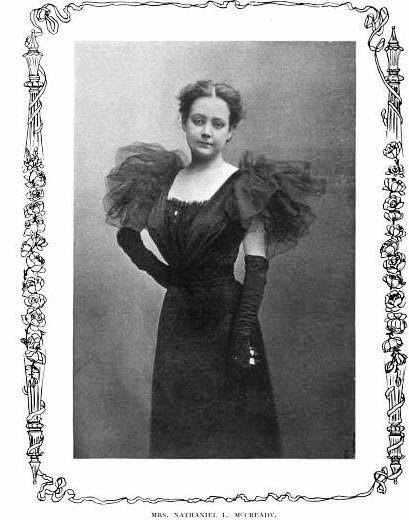 The Sun reported that “The foyer and lobby of the theatre were filled with floral offerings from the theatrical profession and personal friends.” Mrs. Harris sat in a box and the New-York Tribune said “the audience…filled every seat and even stood, unmolested on this occasion, six or more deep behind the last row in the orchestra circle. The New York Tribune reported that during the ceremony August Thomas, speaking for the Lambs, mentioned “the manager’s production and reproduction of ‘The Scarecrow,’ in spite of its failure, ‘for the poetry that is in it.’” What no one in the theater that night, most likely including Mrs. Harris, knew, was that the string of failures had serious repercussions. 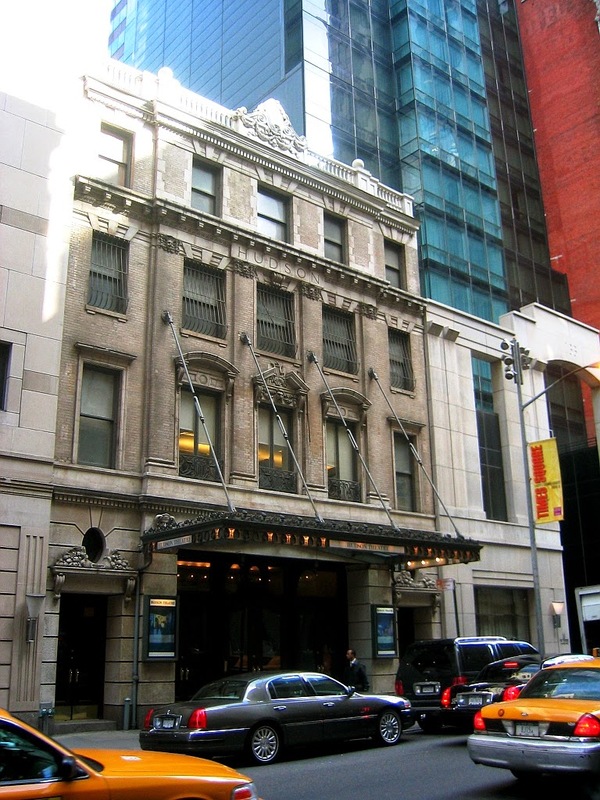 His equity in the Hudson Theatre was $168,232; but it was appraised at only $84,710. He had lost heavily on several productions, including The Quaker Girl, which lost $10,000; Sham which lost $9,000; and An American Widow, which lost $12,000. Irene Harris continued to stage successful plays, including Booth Tarkington’s World War I comedy Clarence, about an American family and a “slowgoing, philosophic doughboy.” Helen Hayes was back to play Cora Wheeler in the cast. The same year W. Somerset Maugham’s Too Many Husbands was staged here. In 1929 Irene took another risky step when she staged the all-black production of Hot Chocolates. The production featured Fats Waller’s song Ain’t Misbehavin’, sung by Cab Calloway which became a hit. The same year Irene was reportedly refused an offer of $1 million for the theater. Had she seen the onset of the Great Depression coming later that year, she most likely would have reconsidered. Among the first of the luxuries that cash-strapped New Yorkers cut out of their budgets was the theater. Managers scrambled for ways to keep their theaters afloat—some turning to the motion pictures, others to live events like boxing—but many were simply boarded up. Irene Harris lost the Hudson Theatre to foreclosure in 1933. It was sold at auction for $100,000; one tenth of what she had been offered. 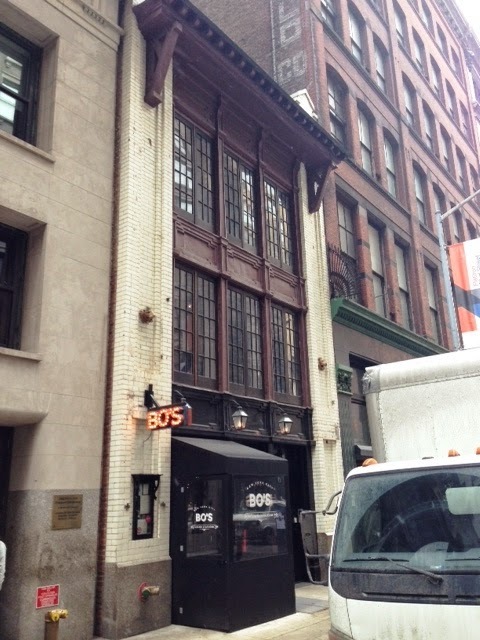 The following year the Hudson became a CBS radio studio, housing the CBS Radio Playhouse. By 1943 it was returned to legitimate theater. That year on December 12 the Professional Children’s School presented a juvenile cast production of Arsenic and Old Lace. It was not well-received by the acerbic drama critic George Jean Nathan. “The presently considered exhibit was drolly acted by the little boys and girls bent on future histrionic careers in some of its roles; but travesty melodrama nevertheless offers difficulties that straight melodrama does not, and some of the children found it beyond their resources.” He offered “I like children myself; I think that some of them are cute; I even think that some of them are peculiarly very good in the acting craft.” But not these. In 1950 NBC purchased the theater, and in 1956 aired the first nationwide broadcast of The Tonight Show with Steve Allen. On the stage of the Hudson Theatre Allen would greet guests like Milton Berle, Elvis Presley and Ernie Kovacs. The theater was shared by the Jack Paar Show, which gave Barbra Streisand her television debut. The Times’ “reliable Broadway sources” were half correct. Negotiations were underway; but the resulting public outcry and demonstrations by Actor’s Equity changed the minds of NBC executives. But the Hudson Theatre would never return to its glory days. For a while it was operated as a burlesque theater, briefly as a legitimate theater, then in 1968 a motion picture house. After sitting vacant for five years the Hudson Theatre was bought by Ron Delsner, a rock music promoter. He established the Savoy Rock Club here; but that, too, was a failure. Harry Macklowe, who planned his 52-story Macklowe Hotel and Conference Center, purchased the old theater from Delsner. 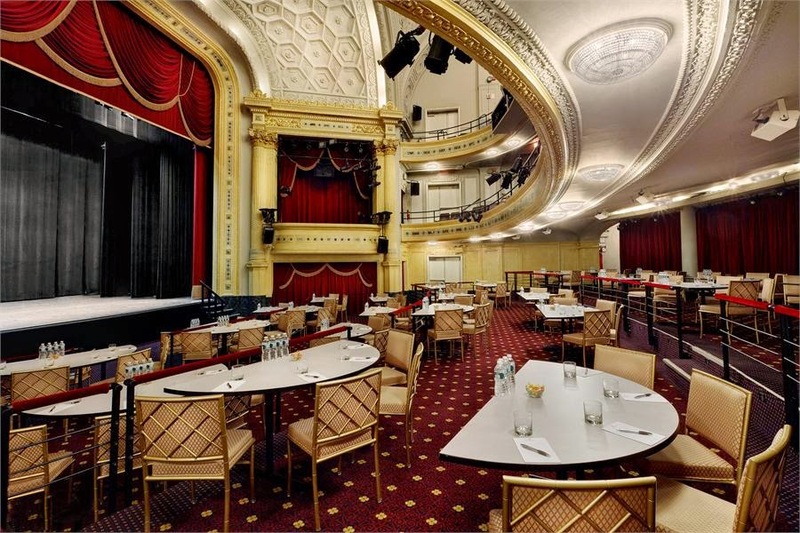 The complex opened in 1989 with the Hudson Theatre as an architecturally fascinating special events space.